I'm located on 6 acres of pinion pines and sage brush prairie, at an elevation of approx. 7,500 ft. During the winter months it can snow up to 3 ft and drop the thermostat into the teens. During the summer months the temperatures here stay relatively nice, however the surrounding desert areas can be scorching. Road access to my dwelling is off of a graded dirt county road, so it is 2 wheel drive accessible year round. The county will normally plow the roads the morning after it snows, but if you visit in the heart of the winter you won't regret having all-wheel drive, chains, or a 4-wheel vehicle. The prime months for visiting are late February through late May, and late September through late November. However with the higher elevation and great variety of activities, any time of year can make for a fun and exciting trip. 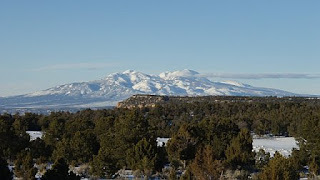 Right from my front door window you can see the La Sal mountains of Moab to the North. If you look to the East you can see the mountain ranges of both Telluride (San Juans) and Durango (La Platas), and 15 minutes to the south puts you in the Blue Mountains (Abajos) of Monticello.